The building is part of a satellite campus of the university located in a light industrial area formerly known for clothing trades. 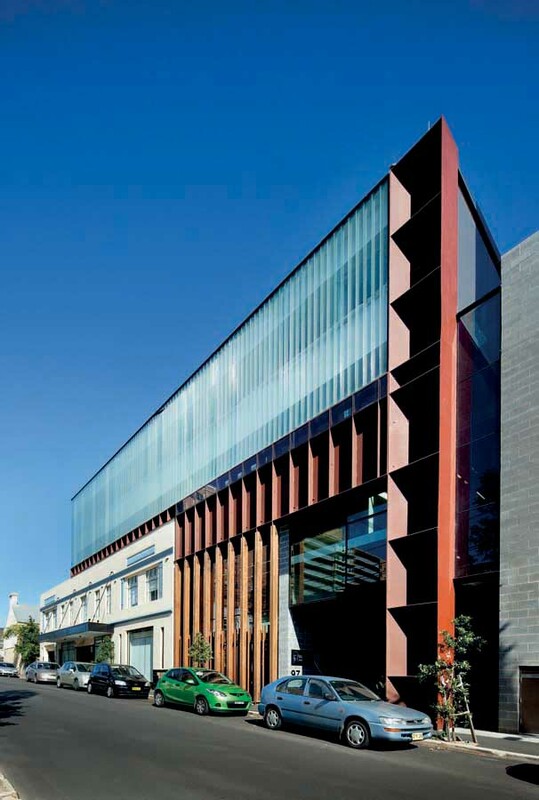 This gritty urban area is respected for its heritage streetscapes and the specific site of the YMHB has a heritage listed façade which required retention. The organisation of the building places the two research floors above and the clinical floors below allowing an upper level bridge connection to further research laboratories in two adjoining buildings. 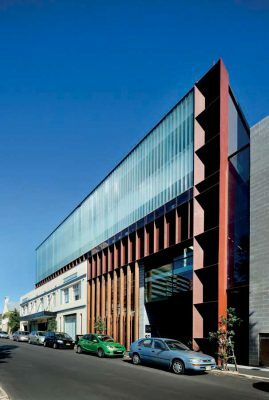 This configuration fitted neatly with the requirement to retain the two storey heritage façade allowing the street composition to be expressed by the placement of the laboratories in a clearly articulated ‘new’ glass box effectively on top of the old façade, with the more tactile people spaces accommodated within the realm of the older component. At the street edge the materials reflect the light industrial context – steel, recycled timber and face concrete block. Internally the floors are linked by an open stair and small atrium containing the social space of the centre. Meeting rooms and all facilities are accessible from this central space, with materials relating to the exterior – timber, steel and concrete – but here used at a more tactile scale reflecting the need to participate in the daily theatre of human activity. The ‘sliding box’ is clad with translucent glass planks ensuring diffuse daylight to the laboratories throughout the day, resulting in very low energy consumption.